Activists from Near West Citizens for Peace and Justice, Third Unitarian Social Action and Fair Food Chicago will host an informational picket of the Trader Joe’s store in La Grange from noon to 1 p.m. This entry was posted in Green Party and tagged Coalition of Imokalee Workers, Congress, demonstration, Illinois, Laurel Lambert Schmidt, laurel schmidt, protest on January 21, 2012 by Ross Levin. This entry was posted in Socialist/left parties and tagged banks, collective bargaining, corporations, demonstration, Governor Walker, legislature, National Guard, Peace and Freedom Party, police, Scott Walker, solidarity, state workers, students, Tax, Wisconsin, workers on February 25, 2011 by paulie. increasingly demonized in recent months. This entry was posted in Socialist/left parties and tagged 9/11, ANSWER Coalition, anti-war, Arab Americans, Cynthia McKinney, demonstration, islamic community center, islamophobia, Manhattan, Muslim, New York, New York City, Party for Socialism and Liberation, progressive, racism, racist, racists, rally, Ramsey Clark, September 11th, Social Justice, world trade center on September 13, 2010 by paulie. Demonstrate against British Petroleum (BP) and their destruction of the Gulf of Mexico and rally for complete reimbursement of damages caused by the oil spill! This entry was posted in Green Party, Socialist/left parties and tagged berkeley, British Petroleum oil spill, California, Communist Party, Communist Party USA, demonstration, Gulf Coast, Gulf Coast oil spill, gulf of mexico, gulf oil spill, oil spill, Peace and Freedom Party on May 26, 2010 by paulie. On May 24, twelve minor party and independent activists demonstrated in front a Sacramento restaurant. Inside, Governor Arnold Schwarzenegger appeared. Guests paid $5,000 each to be at the event, and the money went toward the campaign for Proposition 14, the top-two measure on the June 8 ballot. This entry was posted in Proposition 14 and tagged Arnold Schwarzenegger, Ballot Access News, California, California Prop 14, California's Top Two, demonstration, fundraising event, no on prop 14, Prop 14, Proposition 14, Sacramento, Stop Top Two, Top Two Primaries, top two primaries act, top two primary on May 25, 2010 by paulie. Posted at The Socialist Webzine. Reposted to IPR by Paulie. This entry was posted in Socialist/left parties and tagged demonstration, Socialist Party USA, Wall Street on April 12, 2009 by paulie. On Saturday, March 21st, the group A.N.S.W.E.R. called for an action: “March on the Pentagon: Occupation is a Crime.” At least three third party groups endorsed the event. 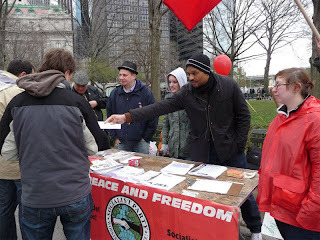 This entry was posted in Socialist/left parties and tagged demonstration, march, Pentagon on March 22, 2009 by Kimberly Wilder.